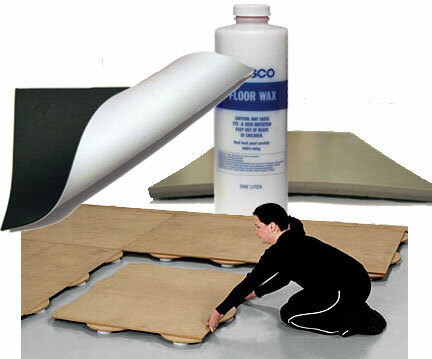 "Just to help you get sprung"
We have just about any kind of stage flooring you need from the sub-floor all the way to the top dance floor surface for your studio. If you are looking for a marley dance style floor, you have come to right place. We have, just about, the largest selection to choose from ready to ship out to today! The most critical factor in choosing a dance floor or marley is how it feels to the people who will use it. Most dancers and managers can determine this from a hand-held sample. A sample can also provide a good idea of the qualities of the vinyl surface. How the marley floor will be used is also crucial. Our floor range provides the perfect floor for any application. All floors may be used for ballet, modern or jazz dancing, but only Adagio and Arabesque are ideal tap or Flamenco surfaces. Touring companies have special needs that are filled by Dance Floor and Cabriole. If permanent installation is of primary concern, consider the dimensionally stable Royale, Adagio or Arabesque. All Rosco floors are constructed of vinyl with a variety of surface treatments to provide the ideal skid resistance and exceptional wear for your application. All marley floors are available in black and grey, but colors and prices vary from floor to floor. For a quick compare chart of the different performance and dance floors please visit our Rosco Floor Choices page. Please Note, Rosco has discontinued the Cabriole flooring. For your reference, we have retained the information on our Roscoe Cabriole page.